Preparing for the holidays on a budget can seem challenging. However, there are many ways you can turn your dinner table into a beautiful setting for guests without spending too much time or money. The following are a few suggestions for decorating on a limited budget. Use what you can from the great outdoors. Twigs, leaves, berries, pinecones and branches can be used as seasonal décor. Place a cake stand or other type of structure to elevate the centerpiece, and line it with an arrangement of outdoor items. 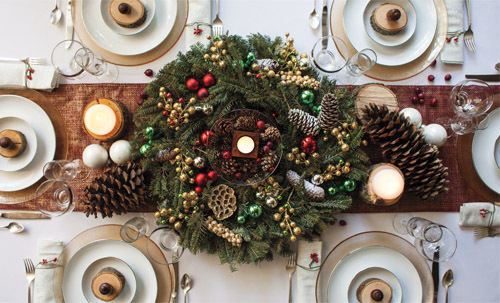 Complement your centerpiece with a few ornaments or ribbons to enhance the holiday look. However, remember not to overfill your table, less can be more appealing. Using food can be a simple and visually appealing way to create an attractive setting. Fruits such as pears, oranges and cranberries, or even small pumpkins and gourds, can make for lovely centerpieces. Fill a few glass jars or vases with a food item that adds color to your setting. Nuts can also pair nicely with many other items. Candles are also an inexpensive way to add an elegant touch to your dinner table. Tiny tea lights can be placed to add a small amount of light. For a different way to use candles in your décor, try placing them inside a large, clear jar, then place nuts or pinecones around the outside base. You could also try using a string of white holiday lights to add a little sparkle. Handwritten place cards add a personal touch and are simple, yet further enhance your table. 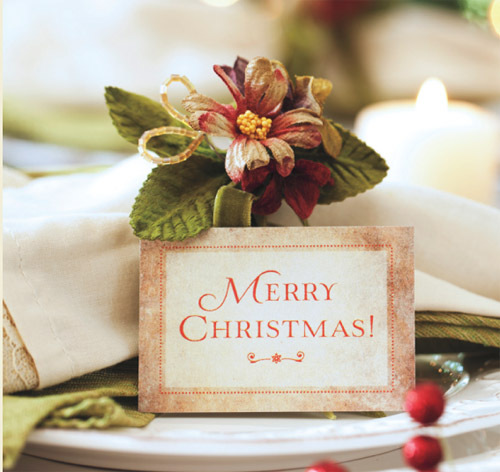 Or, for a printed card, use thicker paper stock in your home printer to give a more professional look. The smallest details can leave a lasting impression. Napkins are a wonderful way to add color to the table. Tie your napkins with a lovely piece of ribbon, then use a few twigs and berries to complete the look. You can also leave candies or mints near the place setting as a gift for your guests. Details do matter!